The Elf on the Shelf: A Christmas Tradition includes a special scout elf sent from the North Pole to help Santa Claus manage his naughty and nice lists. When a family adopts a scout elf and gives it a name, the scout elf receives its Christmas magic and can fly to the North Pole each night to tell Santa Claus about all of the day's adventures. Each morning, the scout elf returns to its family and perches in a different place to watch the fun. Children love to wake up and race around the house looking for their scout elf each morning. SANTA'S LITTLE HELPER - Every night this Scout Elf will return to the North Pole to say whether your family has been naughty or nice. Santa takes that information every night until Christmas Eve when he decides if you're getting presents or coal this year. HIDE AND SEEK - One of the best parts of getting an elf is waking up each morning and trying to spy where they're hanging out for the day. Maybe they're sitting on the fridge or hanging from the light. Maybe they got into some mischief during the night! A NEW TRADITION - A timeless Christmas classic the whole family can enjoy! #1 national bestseller with over 2.5 million copies sold. Touted as "the best thing since The Night before Christmas". MAGIC COMES TO LIFE - Once you've worn out the pages in the Elf on the Shelf book, it's time to pick up another thanks to the Elf on the Shelf Library collection. You children can spend hours of fun reading through their collection of fun Elf on the Shelf books. 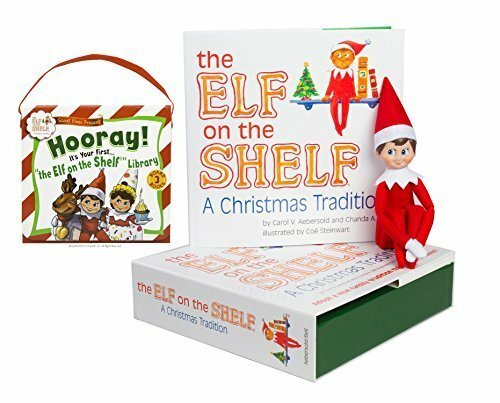 SPECIFICATIONS: Includes (1) Elf on the Shelf A Christmas Tradition Blue Eyed Boy with book and (1) Elf on the Shelf Library with 3 books. If you have any questions about this product by Elf on the Shelf, contact us by completing and submitting the form below. If you are looking for a specif part number, please include it with your message.